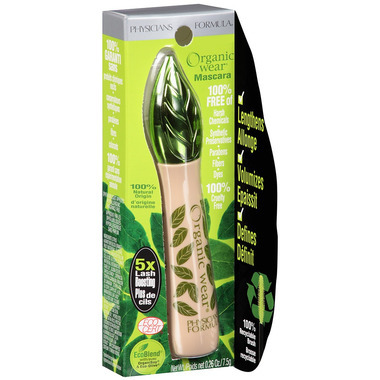 Physicians Formula Organic Wear 100% Natural Origin Mascara's revolutionary 100% Natural Origin formula contains the purest ingredients and provides 5x Lash Boosting for lash length, volume & definition naturally. 100% Recyclable Eco-Brush defines each lash with ultra-soft plastic bristles. 100% Free of Harsh Chemicals, Synthetic Preservatives, Parabens, Clumping, Smudging, Flaking, Fibers & Dyes. Directions for Use: Sweep mascara brush from lash base to tips. Apply multiple coats for added volume. Ingredients: Citrus Aurantium Dulcis (Orange) Fruit Water*, Glycerin, Iron Oxide, Microcrystalline Cellulose, Glyceryl Stearate, Water, Beeswax*, Jojoba Esters, Tapioca Starch*, Copernicia Cerifera (Carnauba) Wax*, Stearic Acid, Glyceryl Caprylate, Aloe Barbadensis Leaf Juice*, Cellulose Gum, Cucumis Sativus (Cucumber) Fruit Extract*, Glycine Soya (Soybean) Oil*, Hydrolyzed Oryza Sativa (Rice) Protein, Leuconostoc/Radish Root Ferment Filtrate, Magnesium Aluminum Silicate, Olea Europaea (Olive) Leaf Extract*. May Contain: Titanium Dioxide *Produced from Organic Farming. Hypoallergenic. Safe for Sensitive Eyes and Contact Lens Wearers. I find this sometimes flakes off near the end of the day, but otherwise it's very good. Good coverage on my lashes and I really like the shape of the brush. When I first opened this I was a little concerned as there did not seem to be much for product on the wand. But this did go on very well! It required an extra coat, but that was ok as it is worth it to have the more natural product. Wonderful product and rated a 1 by ewg.org! Love the brush and it stays on all day with no flaking. Great mascara, doesn't flake and feels good on, not too heavy. I love this product. For the price I can't believe the quality. I love the wand and my lashes look long and healthy. I also love that parts are recycled and obviously natural and free of chemicals. This is a great mascara and it washes off easily! And also have recently become concerned with how some mascaras dried out my lashes and this mascara is a new holy grail product...of which I've never had in the mascara department. Its nourishing, lengthening and natural!! I'm looking forward to trying more of their mascaras! Love this mascara! Doesn't smudge and goes on smooth. This is my new favourite mascara. I love that it's natural, it goes on really well (no clumping, separates lashes, lengthens), & doesn't flake. Although this mascara will run if you happen to burst into tears, I find that that is a small price to pay for how good it feels on my lashes and how easy it is to remove. It separates my eye lashes very well, with zero clumping. Highly recommend. I love that this product is natural - I have sensitive eyes and wear contact lenses. It doesn't flake and it stays on all day. Lengthens nicely. I would give it a 5 if it didn't smudge so easily. this mascara works very well for me and It doesnt have harsh chemicals. Very important to me is the product is not tested on animals. I love that it's natural, because I have sensitive eyes. However, it smudges like crazy. I am pretty active during the day: bike to work and run at lunch. It doesn't hold up to this type of lifestyle. I don't like the raccoon eye look. It does apply easily and doesn't clump very much. I honestly don't know what all the fuss is about with this product. Got it after reading all the great reviews but it doesn't lengthen or thicken my lashes and smudges very easily. Would definitely recommend the Pure Anada mascara instead if you are looking for a natural product. I like this mascara. Looks and feels good and natural! Will buy again! I appreciate how gentle this product is on my lashes and love that I'm avoiding harsh chemicals but at times it flakes off a bit (the only downside to it being gentle). I wear very little makeup to avoid chemicals but this one is rated # 1 by EWG which is the best rating they give and very nice when I want to dress up a bit. Happy this mascara is more natural than those on the common market. It works well, but it runs down a bit plus if I apply it too close to my eyelid, it itches!? Maybe my eyes are too sensitive?! I will only use mascara that does not test on animals. I was thrilled to discover this product. I will definitely buy again. I gave it a 4 because I noticed at the end of the day, the mascara comes off around my eyes - but that could have happened cause I took a nap wearing it! haha, I don't use a lot of makeup so when I do, it has to be as natural as possible, I have read reviews by Adria Vasil, author of ecoholic body, on this product which is why I bought it, next time I'll try another one but still from the same brand. I started using this mascara a couple of years ago because I found my eyes getting itchy and sore from non-natural mascaras. As the other reviewers state it does not make your lashes sky high or huge, but I prefer the natural look and having my eye lashes still look like eye lashes. It does smudge more than some mascaras but there is virtually no clumping, so it's a fair trade off. Best natural mascara you can buy at a great price! Glides on smoothly and leaves my lashes looking healthy and natural. I was hoping I'd like this product, since I love the brand in general, but I found it a bit on the dry side and unable to give my lashes the fullness I'm after. I'll try something different next time. This is a fantastic mascara. I previously only used MUFE or Laura Mercier. This provides length, no clumping or smudging on my oily skin. I love the brush that separates my lashes well. Not the most thickening or volumizing, but I like that. Natural and pretty. Nice product for every day use. Love that it's natural. It does smudge easily. You won't get the thick, long look like you would from regular mascaras. It is important to me that makeup has not been tested on animals' eyes. This has not. It goes on smoothly without clumps, and I like it better than the Body Shop product I used to use. 5 stars! I'm very happy with this organic mascara - applies without clumping and best of all is without chemical additives. Will order again ! This is a nice product it goes on well without clumps. This mascara was recommended to me by my Optomologist because I had eye surgery and can't use products with chemicals. It doesn't run or smear and comes off using a special eye makeup remover. Two thumbs up. Love the way this product looks on my eyes. Very dark and dramatic. It does smudge easily as others have said but I'm just being more aware of not touching my face, which is a good thing! All in all happy to have something without harmful chemicals. Happily surprised with this! Safe and looks great. Very easy to wash off with water. No streaking or running. First natural mascara I've tried. Works just as well as any drugstore chemical-filled mascara. Does smudge fairly easy but I like that it's really easy to wash off. Great product. I have sensitive eyes, and it hasn't bothered me at all. Will use it again for sure. Great product ! Does not clump up the eye lashes. Goes on smooth. Will be buying more of this product!! Excellent product...my first organic mascara...I am very happy...does not irritate my eyes. Light and easy to apply, the brush goes smoothly on the eyelashes; The brush seemed by looking at it a bit to bulky but it works well. The label says it contains organic orange water, aloe and cucumber extracts. 100% natural origin biopolynmers, 100% natural origin preservatives, 100% origin rice protein and organic tapioca starch, color pigment.No petroleum products.